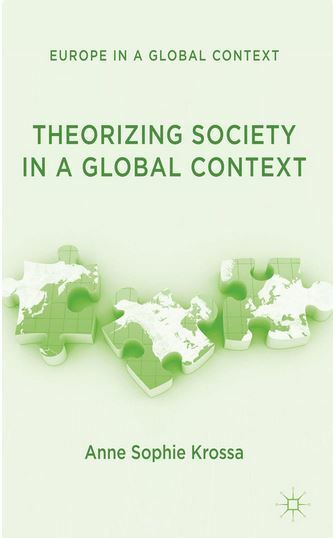 Anne Sophie Krossa’s book on the evolution of globalization and societal developments is a welcome contribution to the ongoing debate on what actually constitutes society in a (supposedly) ever-globalizing world. In this text, Krossa challenges us to rethink the relationship between society and community and the dynamics of heterogeneity and homogeneity that are driven by it. Offering a concise reading of the works of Tönnies, Simmel, Coser, and Dubiel, the author puts her own thoughts neatly into the broader tradition, without being excessively bound by it. Contrary to many other works in the field Krossa does not argue normatively for either unity or diversity, but understands society itself as being constituted by the tensions between homogeneity and heterogeneity. In order to successfully conceptualize society, these two elements cannot be treated as separate entities but as core elements of social interaction, thereby becoming an integral part of society as such. Krossa explicitly avoids falling into polarized positions and makes clear that the poles (e.g. nation state and world society) are important points of reference, but that society has to be seen as a moving object between these poles. Describing society as a dynamic concept based on communication, Krossa shows that globalization is not necessarily a qualitatively new phenomenon, but that modernity has accelerated its quantitative characteristics. While she leaves the questions of the novelty of globalization somewhat open, she addresses the relation between modernization and the speed of globalization. Most importantly, Krossa convincingly argues that modernization should not be misunderstood as Westernization. What comes as a surprise, however, is that the book is not referencing authors like Charles Taylor and Michael Mann, who have dedicated a majority of their research to similar questions like Krossa. Especially the treatment of globalization as modernity in the first part of the book could have profited from including a review of Taylor’s work – which Krossa is undoubtly familiar with. The strongest part of the book deals with the idea of Europe and European society, outlining how difficult it is to actually define European society beyond pure rhetoric. The interaction of supranational institutions and nation-states with their national identities and unique cultural backgrounds makes the European situation an ideal case for the study of the complex relationship between homogeneity and heterogeneity. As Krossa succinctly points out, it is precisely the unfinished character of European society that makes it an ideal case study for the theoretical claims of the book. At times when the political aspect of European society seems to be in a fundamental crisis, re-thinking the relationship between society and nation states on the one hand and society and supra-national entities on the other hand is a necessary task that is met by Krossa’s work.